Praise for staff at hospital. My grandmother has recently had a spell at Scarborough Hospital and had handwritten me a letter to send to The Scarborough News as a way of hopefully getting published to thank them for the service and care they provided her following two recent falls. 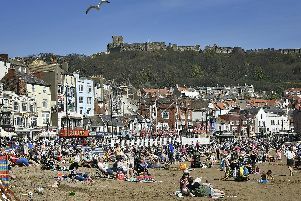 “I have just spent a week in Scarborough Hospital and have nothing but praise for the care I received, and would also like to thank the person who phoned for an ambulance after I collapsed inside Smarts shop in Filey without warning. Three weeks later I had another fall, this time at home and again without warning. This time I landed on my head and caused two black eyes and some painful headaches! I was admitted to Scarborough Hospital, but was a little hesitant after some of the reports I had heard. I spent most of my time in Graham Ward, overlooking part of the hospital I spent years as a nurse some 70 years ago. “I have nothing but admiration for the staff from the cleaners up for their cheerfulness throughout the day (and night!). The staff in the kitchen produced some truly wonderful meals – very different to those we endured during my time at the hospital. It was almost like being in a hotel at times, and I’m sure most patients wouldn’t mind paying a small fee for their meals to help running costs.